Carpenters Local Union 1536, which is known as the Timbermen, Hod Hoist Carpenters, Core Drillers and United Brotherhood Helpers for short, is one of a handful of self-organized locals affiliated with the District Council of Carpenters. Starting with the Timbermen who had no union of their own prior to 1935, they organized workers in subways, sewers, etc., and were installed as a Brotherhood local on February 21, 1935. International headquarters delegated Charles Johnson Jr., head of the Dockbuilders Union to officiate at the installation of the union’s charter. 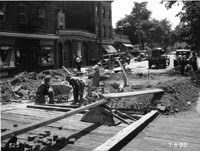 In 1937, the local organized the carpenters helpers, the Timbermen helpers and the Dockbuilder helpers, and incorporated them too into the union. The next year-under the leadership and direction of President Robert M. Johnson, the union organized the Hod Hoist Carpenters, who erect material lifts alongside buildings, and the core drillers and their helpers, who take samples of the substructure (soil, rock, water, etc. ) before a building is erected on the site. 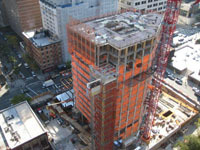 It was no surprise after all these spectacular organizing achievements that the District Council handed “Bob” Johnson and his associates on the Timbermen Union top team, Jerry Bennett and Joe Geffen, the challenging assignment, “to whip into line” every shop that turns out a product related in any way to the carpenters jurisdiction. The Timbermen’s pioneer founder and Business Representative is Robert M. Johnson, who for many years served with great distinction as Secretary Treasurer of the New York City District Council of Carpenters. Because of the local’s size over 2,500 members-3 more Business Representatives are required to minister to the rank and file’s needs. In the trio are Secretary Treasurer Joseph M. Geffen, Conductor David G. Bennett, and Trustee Charles Johnson III. Occasionlly, Johnson drafts into service the other officers Andrew Gransasso, Vice President, Daniel Lyons, Recording Secretary; Gus Bender, Warden; and Daniel Butler and Fred Sciallis, Trustees. Timbermen are members responsible for shoring and sheeting work for all underground projects, which include subway, sewer, water main, telephone and electric lines. Coredrillers are members who do all of the preliminary work for prospective construction sites. They take “soundings” to find out what’s beneath the surface of buildings, subways, bridges, houses, gas stations, or anything to find out what sub-surface safety and foundation conditions are. Wood Tankers are members who install, maintain and clean manufactured cooling towers and tanks in most buildings. 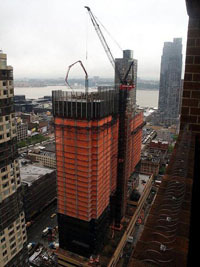 Hod Hoist Carpenters are members who erect and maintain the material and personnel hoist on new construction sites. They also work on scaffolding and sidewalk bridges across the city.